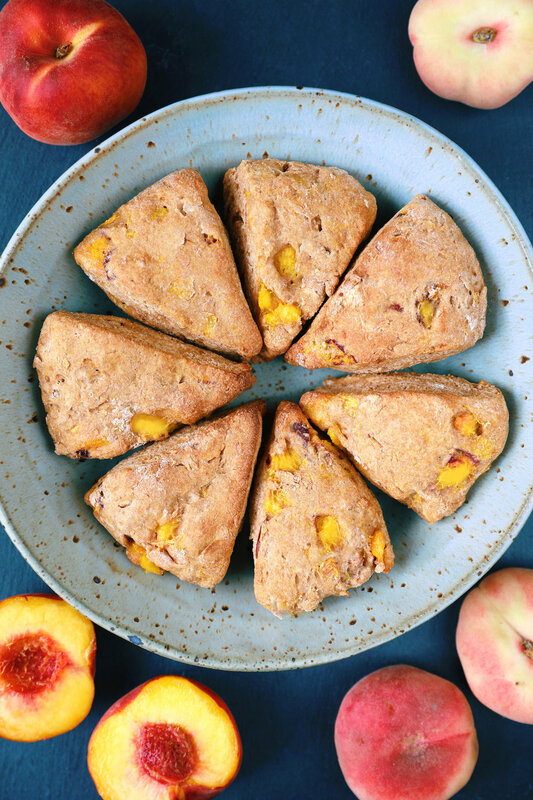 These delicious peach scones are made with whole grain spelt flour, coconut butter, and vanilla. They're just the right amount of lightly sweet, crumbly, and buttery, with no oil or refined sugar needed! Coconut butter is simply coconut meat that has been blended. None of the fiber has been removed and nothing about it is refined, unlike coconut oil, which is much more heavily processed. Coconut butter still contains all of the fiber, minerals, and vitamins found in coconuts. These scones are sweetened with unprocessed raw coconut sugar as well as being naturally sweet from the addition of ripe juicy peaches. It's rare that I use peaches in baking because around here they usually get eaten raw as soon as they're ripe, but some of the peaches we've been getting just aren't quite as good as the others when eaten fresh, so I chose to save them and use them for baking instead as the baking process makes them even sweeter. These scones are so easy to make, with a very simple ingredient list and such a quick baking time that you can start making these now and be enjoying the most delicious scones in under 30 minutes! First, preheat your oven to 425F, then mix together the dry ingredients. Slice in the soft coconut butter using a pastry dough mixer or a fork until the coconut butter is broken into smaller than pea sized pieces. Mix the wet ingredients together in a bowl, then add the wet mixture and the peaches to the dry ingredients and mix using a utensil at first and then your fingertips to mix the dough for up to 2 minutes. Sculpt the dough ball into a circle that's 8 inches wide and 1 inch thick. Slice it into 8 wedges using a serrated bread knife or floss. Transfer the wedges to a parchment lined baking pan and bake for 10-15 minutes. Check on them after 10 minutes and watch carefully so you can remove from the oven as soon as the edges turn lightly golden brown (I left mine in maybe 1 or 2 minutes too long so my edges are a little darker than what you're looking for). Remove from the oven and allow to cool on a cooling rack for a few minutes. Then serve plain or with more coconut butter, nut butter, jam, or other toppings of your choosing. I always like keeping these scones plain because I find it makes them easier to take on the go, and I think these taste so good already without any toppings needed! I have started posting my recipe videos on our YouTube channel again! We started our YouTube channel when we were traveling to Hawaii in 2016 and wanted to make some home videos to preserve some memories of our trip, then quickly it turned into an Airstream channel when we moved into our travel trailer and documented our travels across the US from NYC all the way to Seattle. Now that we're here, I'm finally all settled in and ready to film all of the recipe videos I've been wanting to make but didn't quite have the space to film when we were living in the Airstream. I plan on filming many more videos for my recipes and posting them on our channel and on my blog from here on out. Making a video for each and every new recipe, as well as going back and filming videos for some of my old favorite recipes here on my blog is no simple task, but I know how much it helps me to have a video to reference for other recipes that I follow, so hopefully you find them helpful too! If peaches are already going out of season where you are, feel free to use defrosted frozen peaches, canned peaches, or even another kind of fruit if you want. Let me know what you think of these scones if you try them out!